Police in the southwest Austin suburb of Sunset Valley think that a package that exploded early Tuesday at a FedEx sorting facility in Schertz, Texas, may have been shipped from their local FedEx Office store. The Brodie Lane store in a popular Sunset Valley shopping center has been roped off by authorities, including about 15 to 20 federal agents who have been investigating a string of four bombings this month in Austin. The store has been closed but surrounding businesses are still open. Sunset Valley city officials said in a statement that there was “no known public threat” to residents or shoppers. The FedEx store in Sunset Valley — an independent municipality surrounded by the city of Austin — is just two miles from where a bomb exploded in a residential subdivision Sunday night, injuring two men. 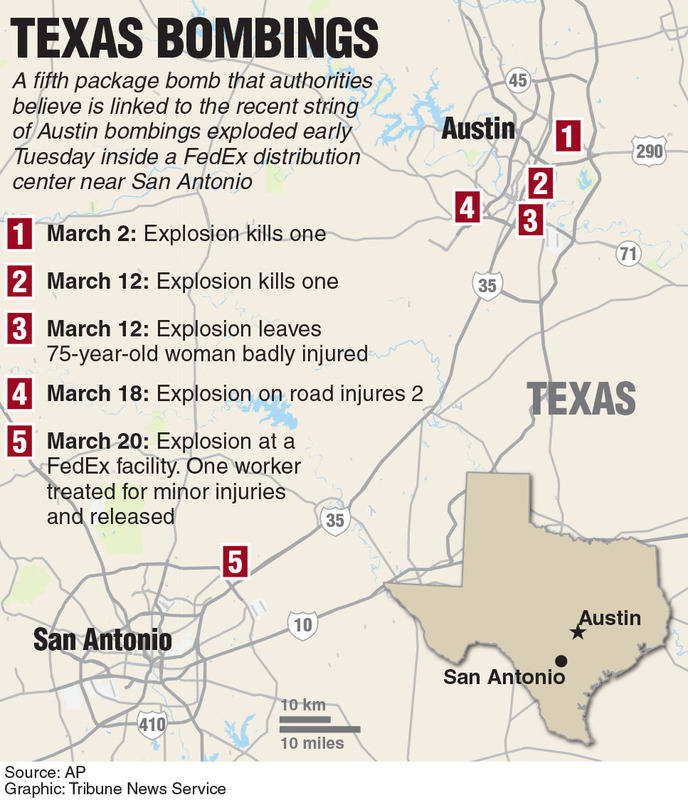 About 12:25 a.m. Tuesday, a package that investigators think was destined for Austin exploded on an automated conveyor belt at a FedEx ground facility in Schertz, about 60 miles south of Austin. That package is believed to have been shipped from Sunset Valley. Hours after the Schertz explosion, Austin police and fire crews began investigating reports of a suspicious package around 8 a.m. Tuesday at a similar sorting facility in Southeast Austin near Austin-Bergstrom International Airport. Authorities are using a “working theory” that the package that exploded in Schertz was bound for Austin, interim Austin Police Chief Brian Manley told members of the Austin City Council during a work session Tuesday morning. “We do believe that these incidents are all related. That is because of the specific contents of these devices,” Manley said. Four bombs placed in neighborhoods across Austin have killed two people and injured four others since March 2. “The first three appeared to be targeting a particular resident — or address, I should say,” the chief said, adding that a fourth device — which used a trip wire and was placed in the open — was “very different” and altered investigators’ focus. Shortly after Manley briefed council members, Austin police announced that the department has responded to more than 1,200 calls about suspicious packages since 8 a.m. March 12, including 420 calls between 8 a.m. Monday and 8 a.m. Tuesday.